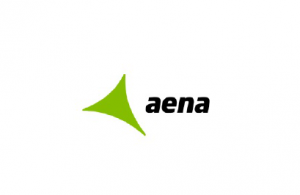 Today I noticed in my account that the yearly dividend of Aena SA was increased from €6,50 to €6,93 per share. This is an increase of 6,6%. As a result of this dividend increase my yearly estimated dividend income increased by €5,16. Due to the increased dividend my yield on cost is now 4,44%. 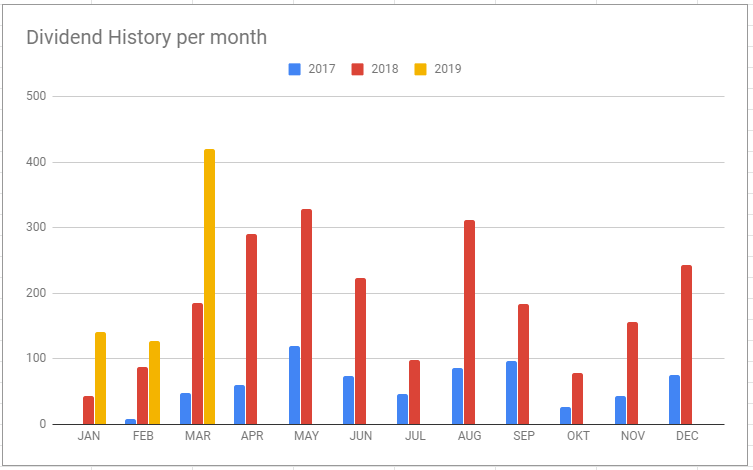 March was a record breaking month for me. I received €420,64 in dividends. 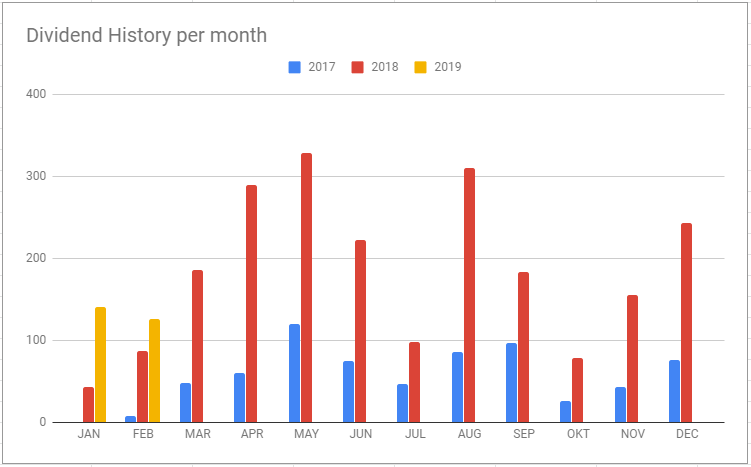 This is an YoY increase of 127% and this is the most I ever received in one month. This month I received payments from 15 companies. Biggest payers this month are for me Unibail Rodamco Westfield, Royal Dutch Shell and Macquarie Infrastructure Company. Besides the €420,64 I received as dividend income. I also realized an extra income of €135,20 from expired or closed written put options. Recently BMW announced a reduction of their dividend by €0,50. The dividend got reduced from €4,00 to €3,50. Based on the cyclical nature of the automotive industry I understand that BMW is a position in my portfolio where times of dividend growth can stop for some time, although I not expected a cut this year already. Based on the relative low payout ratio of BMW I assumed a steady dividend. As a result of the dividend reduction my yield on cost will now be 4,87%. I hold this position in my portfolio. Today I purchased 26 shares Bayer against a price of €57,24 including costs. Bayer is down almost 50% to it’s 52 weeks high. Last month the stock price declined almost 20% after a U.S. jury found the Roundup weed killer to have been a substantial factor in a California man’s cancer. I decided to start a position in Bayer to keep them for the long term and enjoy their divind of €2,80 per year. My yield on cost will be 4,89%. Bayer has many quality divisions, but the stock price is under big pressure due to legal issues regarding Roundup. Bayer acquired the Roundup brand as part of the merger with Monsanto. My yearly estimated dividend income increased by €72,80 as a result of this purchase. In February I received €126,17 in dividend payments. Previous year in February I received €86,53 so my dividend income is up 231%. This month I received payments from only 6 companies. Dividend payments from AbbVie, Omega Healthcare Investors and Simon Property Group are responsible for over 50% of my income this month. Besides dividend income I also secured €10,15 in option income from a written put on ING. Bank of Nova Scotia announced a dividend increse of 2,4%. The dividend goes up from CAD 0,85 to CAD 0,87 per quarter. I have 32 shares of Bank of Nova Scotia so my yearly dividend income will increase with CAD 1,66. As a result of the dividend increase the yield on cost is now 4,89% for me. This is the 18th dividend increase this year for me. Royal Bank of Canada announced a 4 cent increase of their quarterly dividend. The dividend is increased from C$0,98 to C$1,02. This is an increase of 4,1%. I have 21 shares Royal Bank of Canada. As a result my yearly estimated dividend income will increase with C$2,18. Based on the new dividend my yield on cost is now 3,48%. This is the 17th dividend increase in 2019 for me.